Whether you’ll be visiting for a day or longer or if you are already a resident, we invite you to take part in the many opportunities Riverside has to offer. Through the city’s 26 community neighborhoods, Riverside is a hub for higher education, technology, commerce, law, finance, and culture. Riverside is strategically located at the crossroads in Southern California offering a blend of small town charm and hospitality with the vision, energy and creativity of a rapidly developing metropolitan area. The city’s commitment to maintaining quality of life amenities is demonstrated by the variety of museums, theaters, fine dining options, array of festivals and markets, and unique shopping experiences for visitors and residents alike. Ranked as the 6th largest city in Southern California and the 12th largest in California, Riverside is a hub of higher education with four internationally recognized universities and colleges located here serving more than 50,000 students. As the county seat of Riverside County, the city is a vital financial and professional center. Numerous legal, accounting, brokerage, architectural, engineering and technology firms, as well as banking institutions make Riverside their principal place of business. The city is currently more than halfway through a $1.8 billion initiative called “Riverside Renaissance,” which focuses on vital transportation improvements, infrastructure upgrades and quality of life projects including parks enhancements, landscaped medians, and expansions in the library system. # 1 for Job Growth in 2013- Riverside and the surrounding metro area topped the nation with 4% job growth according to a report by Professor McPheters from the W.P. Carey School of Business at Arizona State University. Intelligent Community of the Year 2012 – Selected from over 400 of the world’s best cities, Riverside was recognized by the Intelligent Community Forum (ICF) for its efforts to improve the quality of life and is confirmed as a community that is a great place for people to work, do business, and raise a family. 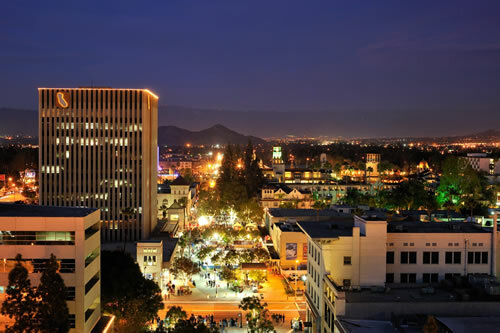 Top 25 City for Business – Executive Outlook Magazine named Riverside as a top 25 city for business and identified it as a bright spot in a tough economy. #2 in Cities with the Fastest Broadband – Business Insider listed Riverside as #2 of 10 U.S. cities utilizing broadband technology. #6 Happiest City for Young Professionals by Forbes – Riverside earned an impressive 6th place ranking out of the top 10 cities in the U.S.
2013 Playful City USA Award – Riverside has been recognized five consecutive years by KaBoom! National Campaign for Play for American cities that have made innovation play for children a priority for the community.